The next US administration should allocate at least $1 billion in additional resources—equal to a little over two percent of current US overseas assistance—exclusively dedicated to advancing gender equality in developing countries, with a specific focus on improving women’s and girls’ economic opportunities and outcomes. Women and girls continue to lag in terms of economic participation and empowerment globally. This is an issue of both rights and economics. Through discriminatory norms and institutions, women and girls are prevented from realizing their full potential, where they and their children as well as economies and societies bear the costs. The world needs to ramp up action on global, regional, and national levels. Innovation—and bringing innovation to scale—are badly needed. The US has a unique opportunity to lead in improving economic opportunities for women and girls by establishing a global vision and a corresponding fund with significant financial resources to spur change, implemented through bilateral, multilateral, and innovative financial channels, and involving both government and private sector actors. The fund should use robust metrics to define benchmarks of success and rely heavily on data and the evidence base to invest in approaches proven to work. Funding should be allocated to support women and girls’ education, employment, and leadership opportunities within the fields of science, technology, engineering, and math (STEM), as well as the security and justice sectors (e.g. peacekeeping, policing, and judiciary). Funds should be dedicated to providing incentives to public and private sector institutions to narrow gender gaps in these fields with traditionally low levels of female participation, as well as establishing appropriate and context-specific monitoring systems to document progress. Investments should also be made in rigorous research that examines effective interventions, identifies the mechanisms behind their success, and assesses their potential for replicability and scale. Through US development institutions such as OPIC (or CGD’s proposed US Development Finance Corporation) as well as multilateral institutions such as the IFC, funds should be allocated to narrow gender gaps in access to capital, by making funding available to and designing financial products targeted to the women’s market. Women-owned businesses can be given priority financing through these channels (just as US businesses are currently prioritized for OPIC financing), and US funds should be allocated in a way that maximizes their leverage to encourage private sector investments in the women’s market. Much of the attention and funding for women and girls in post-conflict and fragile state contexts has focused on humanitarian assistance, health, and primary education, but to date little has been done to ensure women and girls in these contexts have access to quality job and livelihood opportunities. Such economic opportunities respond to the particular demographic profiles of societies that have experienced death and destruction and are likely pivotal in contributing to economic rehabilitation, and research and investments are thus needed to promote women’s economic empowerment in these contexts. Funds should also be dedicated to incentive-oriented approaches applied across sectors and contexts including but not restricted to those specified above. Through cash transfers distributed directly to women and girls, as well as performance-based payments and rewards to domestic and foreign programs and institutions, funding should encourage behavior change and mobilize increased public and private sector resources to narrow gender gaps in areas such as educational attainment and outcomes, or access to agricultural resources and markets. Institutions within the power sector, for example, can be incentivized to increase women’s inclusion on the supply-side, (as women’s share of employment within the sector sits at just 12 percent), providing a source of non-traditionally female employment opportunities, as well as narrow gender gaps in equal access to affordable sources of energy. IDA loans can be complemented by results-based payments, awarded if loan recipients achieve specific gender-related outputs and outcomes, yielding a 6 to 1 return on investment. Funds should be invested to foster enabling environments that allow women and girls to reach their full economic potential. Research and investments are needed to better understand and reform laws and regulatory frameworks—ranging from terms of trade agreements and investment treaties and their corresponding enforcement mechanisms, to procurement channels, to tax regimes—that are currently gender-biased and limit women’s equal access to quality employment, finance, and leadership opportunities. Funding should be allocated for data collection through rigorous evaluations and routine monitoring systems in each aspect of new programming for women’s economic empowerment. The secretariat (described below) should house its own global data initiative, and programs implemented through bilateral, multilateral, and pooled funding mechanisms should all have accompanying data efforts. (See the chart below for a visualization of funding allocations.). As proposed, the White House would provide overall direction to the fund, which would be operated out of the US Agency for International Development. The White House would also provide US leadership in a new international secretariat modeled on the Open Government Partnership, which would coordinate and monitor pledges towards policy change across member countries to improve outcomes for women and girls. The secretariat should house its own data initiative, which will develop global metrics for monitoring, fund rigorous evaluations where applicable, and compile lessons learned. The proposed budget for this function is $50 million, of which 80 percent should be devoted to generating data and building the evidence base. The remaining $950 million should be distributed through three avenues: bilateral aid channels, multilateral organizations, and a new vertical, pooled fund. $570 million (60 percent of the remaining funds) should be distributed directly to countries and in-country institutions through bilateral channels, with 10 percent of the $570 million ($57 million) earmarked for necessary data and transparency efforts, including data collection through evaluations and routine monitoring systems. Rigorous metrics should guide the disbursement of all funds. 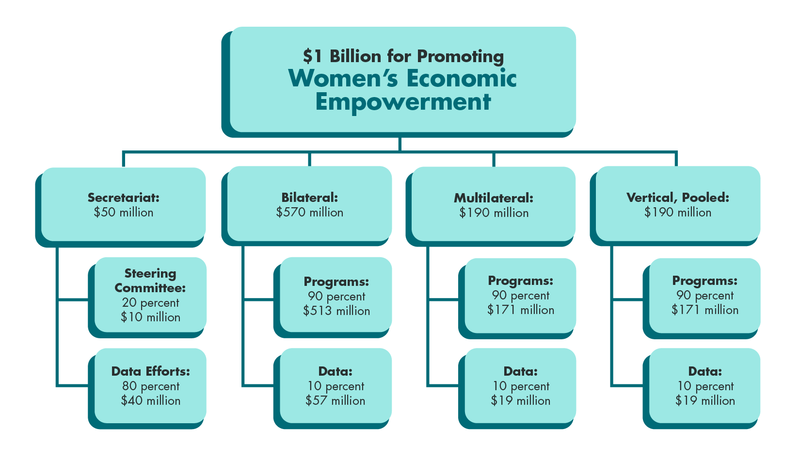 Multilateral institutions should receive $190 million for programming focused on women’s economic empowerment, of which 10 percent ($19 million) should be dedicated to data and transparency. The newly-created vertical fund should function as a pooled mechanism, leveraging a $190 million commitment from the United States to generate contributions from other public and private sector institutions. (Using the models of Gavi, to which the United States has contributed 10 percent of its total funds, and the Global Fund, to which the US has contributed 31 percent of the total, we suggest a 20 percent contribution from the United States for this new pooled mechanism focused on women’s economic empowerment, projecting the ability to generate $950 million total.) Consistent with the allocations described above, 10 percent of the United States’ contributed $190 million ($19 million) should be allocated to data and transparency efforts. 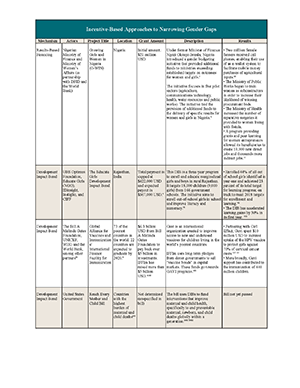 Note: This memo builds upon a proposal initially put forth in CGD briefs Promoting Women’s Economic Empowerment through US Foreign and Development Policy and Three Big Ideas + Three Smart Reforms for US Development Policy. Thanks to Tanvi Jaluka for assistance with background research.